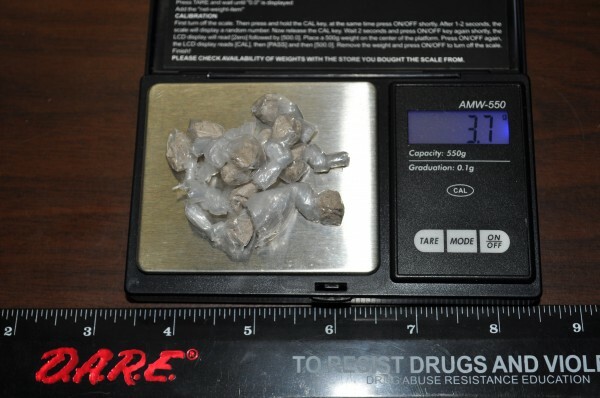 Approximately 5 grams of heroin, packaged for sale, was seized during a sting in Brunswick in May 2013. Heroin-related deaths are on the rise in Maine. AUGUSTA, Maine — Drug overdoses and related abuse killed 176 people in Maine in 2013, marking just the third time in the past 15 years the drug-related death toll has topped 170. According to figures released by the Maine Attorney General’s office on Monday, there were 13 more drug-induced deaths in Maine last year than in 2012. Of the 176 deaths, 105 were attributable to prescription opiates and 34 were caused by heroin. While accounting for only about 19 percent of all the drug-related deaths in the state last year, deaths attributable to heroin have seen a meteoric rise since 2011, when the drug killed just seven people in Maine. In 2012, there were 28 heroin deaths. Attorney General Janet Mills said in a news release that heroin use is on the rise in part because new regulations require tamper-resistant packaging for prescriptions for oxycodone. Mills also wrote about the dual need for law enforcement and treatment to fight drug addiction and related crime in Maine. Last year’s figure is the highest since 2009, when drugs claimed 179 lives in Maine, and is tied with 2005 for the second-deadliest year since 1997. From ’97 to 2000, there was an average of 53 drug-induced deaths per year. Then the figure skyrocketed, rising from 60 in 2000 to 165 in 2002. Since then, the annual death toll has never dipped below 153. But there’s some hope, at least among lawmakers, that the trend could reverse. The Legislature recently passed a bill aimed at stemming the tide of opiate-related deaths. The bill, spearheaded by Freeport Democrat Sara Gideon, expanded access to Narcan, a drug that can be administered during an overdose and buy the subject enough time to seek medical treatment. The drug is administered the same way as an EpiPen, and is known to save lives. Now, for the first time in Maine, it can be made available to police, firefighters, basic EMTs and addicts’ family members (paramedics and hospitals already had access to the drug). The idea is to increase the likelihood that someone with Narcan will be on-hand to save a life. In Quincy, Massachusetts, police officers launched a pilot project to carry and administer Narcan. In 18 months, starting in 2010, the police department administered the drug 179 times, including 170 overdose reversals. According to the federal Centers for Disease Control, the use of Narcan has reversed the effects of more than 10,000 overdoses nationwide since 1996. Roy McKinney, chief of the Maine Drug Enforcement Agency, said Monday that Narcan may help in some scenarios, but it will take a lot more than that to make major dent in the opiate-related deaths.